Newcastle Scout leader Bill Burris, a Newcastle Trails board member for many years, has received Scouting's prestigious Silver Beaver Award from the Chief Seattle Council of BSA. This is the highest award for a local Scout leader, given to recognize Scouters of exceptional character who have provided distinguished service within a Council. As leader of the Hazelwood Troop (499), Bill has mentored a generation of Scouts, many getting Eagle rank after building portions of local trails, or trail amenities (benches, kiosk, bridge). Bill also received a 2019 Diamond Award from the Newcastle Chamber of Commerce (see Price and Burris Win Diamond Awards). The Trail of the Month for April is the Highlands Trail, which starts on Coal Creek Parkway at SE 91st Street, and loops around the Highlands at Newcastle. The first section, the South Highlands Trail (1.6 miles) follows a wooded corridor around the south and east sides of the Highlands to the Terrace Trail. The return section, the North Highlands Trail (0.7 miles) crosses several streets. The trail offers a pleasant walk through wooded areas, yet it’s never too far from backyards and streets. There are several stormwater ponds along the route, which attract plenty of wildlife. If you go right after a rain, you may hear the trill of Red Wing Blackbirds. Check it out today – it’s fun for the whole family! And post your photos using the hashtags #NewcastleWA, #HikeNewcastle and #NewcastleWA25. 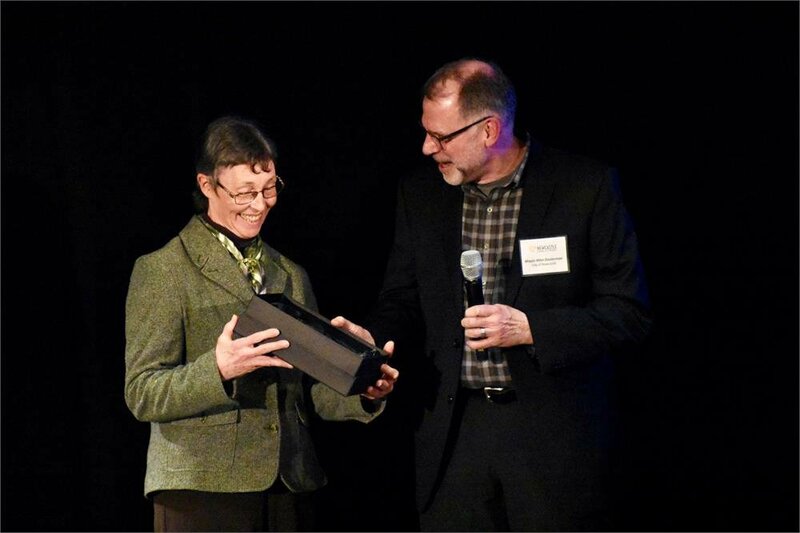 Newcastle Trails board members Peggy Price and Bill Burris were both given 2019 Diamond Awards by the Newcastle Chamber of Commerce. The awards were handed out during a special gala at the Golf Club at Newcastle on the evening of March 14. NT Treasurer Peggy Price won the Mayor's Award for Volunteerism, and local Scout leader Bill Burris won the Dennis Yarnell Inspiration Award. Aside from her work as NT Treasurer and trail advocate, Peggy has spent more than 5500 hours over the past decades on trail work: clearing brush, moving rocks, hauling debris, and supervising other volunteers. She's also worked on trail signs, route-finding, and documentation (newsletters, website, trail guide, trail construction standards). Bill Burris has been a local Boy Scout leader for a generation, mentoring Scouts, many of whom got their Eagle rank after building portions of local trails or amenities (benches, kiosk, bridge) along our trails. This year Bill also received Scouting's prestigious Silver Beaver Award, the highest award for a local Scout leader, from the Chief Seattle Council of BSA. We congratulate them both, and thank them for their many years of service to the community. The late Jim Price was also honored by the Chamber, which renamed its Community Leadership Award after him. This year's Jim Price Community Leadership Award went to Malcolm Lawrence. Jim was a tireless community volunteer. He helped to found Newcastle, and he was also a founding member of the Newcastle Chamber of Commerce, Newcastle Trails, and the Newcastle Arts Council. He was Newcastle Trails' Vice President until his death last August, while also serving on Newcastle's Community Activities Commission, and the Arts Council. NT board members receiving awards in past years include Bill Burris, Jim Price, Peggy Price, Garry Kampen, and Giles Velte. Like Jim, Giles helped to found Newcastle, the Newcastle Chamber of Commerce, and Newcastle Trails. He was the Chamber's first chair, serving four consecutive terms, and served on the initial Planning Commission after helping to write Newcastle's first Comprehensive Plan. 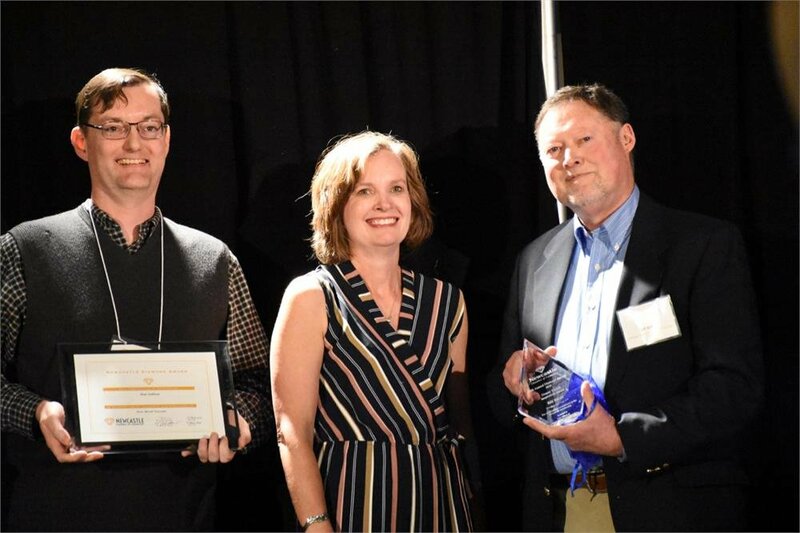 Kent Sullivan (left) and Bill Burris (right), winner of Dennis Yarnell Inspiration Award 2019. Peggy Price Receiving Mayor's Award from Mayor Dauterman 2019. The Trail of the Month for March is the China Creek Trail (0.8 miles, mostly easy), which starts at the east edge of Hazelwood Ridge, descends steeply to 129th Ave SE on steps, and circles the north end of Lake Boren (partly on boardwalks) to join Coal Creek Parkway just north of Aegis Gardens. As the woods continue to thaw out from the recent snow, explore a wetland boardwalk in the heart of Newcastle! The trail follows the north side of China Creek, providing excellent bird watching. The west end of the boardwalk can be accessed from 129th Avenue SE at the north and south ends of the Lake Boren Townhomes. From the library, walk 2 blocks south and turn left (east) on SE 75th Street. Check it out today – it’s fun for the whole family! And post your photos using the hashtags #NewcastleWA, #HikeNewcastle, #NewcastleWA25. A new segment of the CrossTown Trail is now open to the public! The long-awaited section, which is the CrossTown Trail's westernmost segment, is located along the eastern edge of Risdon Middle School. For the full article, with a map, see CrossTown Trail Opens on the City of Newcastle website. Newcastle Trails is happy to announce the winning entry of our 2018 photo contest, "China Creek Boardwalk" by Brice Lambson. 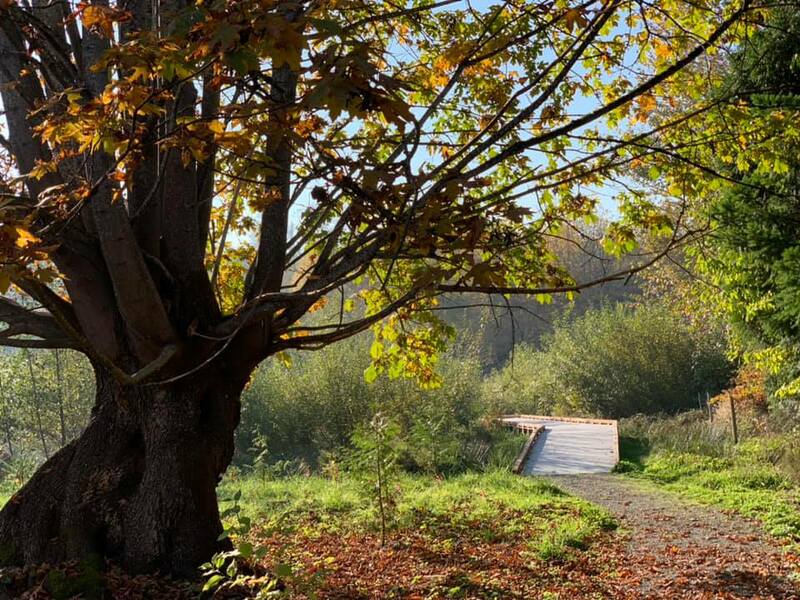 We selected this photo because it not only features one of the newest trails in Newcastle but also nicely shows how trails can enhance an urban area and help preserve nature; in this case the old maple tree. Congratulations, Brice! We will send you a message with details on how to claim your prize, a signed copy of Eva Lundahl’s trails book. All the contest photos are displayed on our Facebook Page. Many thanks to all of you who participated!! We will feature all your entries on Facebook in the coming weeks. All the submitted photos were fantastic!! We look forward to seeing more pictures from all of you in 2019. On 11/29/18 Newcastle Trails sent a newsletter to its members updating three topics: the Photo Contest; the effort to save the DeLeo Wall; completing the Horse Trail connection to the May Creek Trail. Newcastle Trails is holding a photo contest from November 10 through December15 to select the best photo taken on one of Newcastle's many trails. Entrants should post their best photos on Newcastle Trails' Facebook or Instagram pages. The winner will be announced on December 16 and will receive a signed copy of the book, "14 Shorter Trail Walks in and around Newcastle", by local author Eva Lundahl. The winner will also have his or her photo featured as the Newcastle Trails' Facebook cover photo in January 2019 (with their permission) and on this website. For contest rules, see NT Photo Contest. A committee has been formed to create a memorial to Jim Price, using a fund established by Newcastle Trails. The memorial committee includes representatives from local groups Jim was involved with, including the Chamber of Commerce, Community Activities Commission, Newcastle Historical Society, and Newcastle Arts Council. The memorial will likely include a plaque and be sited in a park near a trail. Donations can be sent to the NT treasurer, Peggy Price, at 9131 122nd PL SE, Newcastle, WA 98056. Checks should be made out to Newcastle Trails (For: Jim Price Memorial). Donations are tax-deductible. Newcastle Trails mourns the loss of our long-time vice president, Jim Price, a tireless community volunteer who moved to Newcastle in 1986 with his wife Peggy. He helped to found the City of Newcastle in 1994, and was a founding member of Newcastle Trails, the Newcastle Chamber of Commerce, and the Newcastle Arts Council. Since 2013 he served as a volunteer on the City's Community Activities Commission. His memory will live on in Newcastle's trail system, and the Newcastle institutions he helped to create. A public memorial service honoring Jim was held at Lake Boren Park on Sunday, Sept. 16, at 1:30 p.m. The book 14 Shorter Trail Walks In and Around Newcastle by NT member Eva Lundahl is now available from Amazon. The book includes detailed trail maps, local history and geology, and the delights of each walk: plants and animals; historic sites and artifacts; views, waterfalls, and moss-covered boulders. There are expert photos of all these things, and even an index. Eva is donating the proceeds to Newcastle Trails; buying the book via this website increases the share of the price going to NT. A forested hillside in SE Newcastle may be logged in the near future, and local residents have rallied to preserve it. The tract adjoins Cougar Mountain Park, and it contains the DeLeo Wall Viewpoint. Buying the tract and adding it to the Park would preserve the Viewpoint and several trails. 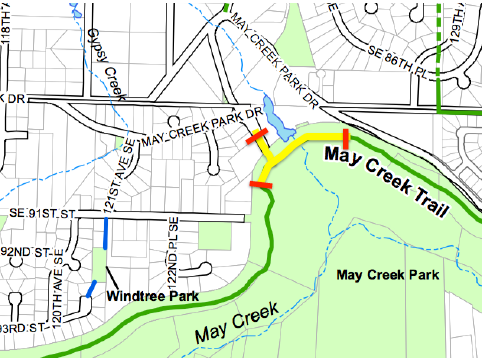 The May Creek Greenway is complete from the Renton boundary at Windtree to Cougar Mountain Park. It will reach almost to Lake Washington when Renton completes its section of the May Creek Trail from Newcastle to the rail trail (now under construction) in the Eastside Rail Corridor. The CrossTown Trail is now open and walkable from Newcastle Way (near Risdon Middle School) to Cougar Mountain Park. The East CrossTown Trail (east of Coal Creek Parkway) awaits improvements and trail signs. And the West CrossTown Trail (west of the Parkway) awaits trail signs and two major relocation projects: moving the trail into the woods by the Middle School ballfields; moving the trail to a shorter route along the south shore of Lake Boren. The China Creek Trail is essentially complete from Hazelwood Ridge to Coal Creek Parkway, but is closed by a fence at the Parkway. The Thomas Rouse Trail in the Newcastle Commons is complete (mostly on sidewalks) from Bellevue's Coal Creek Trail south to the top of the mound (mini-park with view). Newcastle Trails is working with City staff (Julie Cassata) on trail signs for most of these trails (and others). In Hazelwood Ridge, a new 30-home development on 126th Ave SE between Hazelwood and Olympus, the CrossTown Trail has been relocated onto a mix of sidewalks and City-owned trail easements. Trail sign bollards have been installed, and sign plates will be ordered soon. East of 126th, the trail leaves the sidewalk and follows a mostly easy grade past the historic cemetery into Lake Boren Park; this segment needs improvements (new trail sign, slope mitigation) west of the cemetery. At Risdon Middle School, the relocated trail will start just opposite the Newcastle Way crosswalk from Newport Hills. The work is scheduled for this summer. At Lake Boren Park the trail will be relocated onto newly acquired parkland south of the lake, crossing the wetland on boardwalks elevated to give views of the lake. It will provide quick access to the East CrossTown Trail and the east side of the expanded park. And (with a trail along the east lakeshore) it will complete the long-sought around-the-lake trail. These lakeshore trails are part of the planned park redevelopment. China Creek Trail. The trail is now essentially complete from its junction with the CrossTown Trail in Hazelwood Ridge to its current end-point on Coal Creek Parkway. From Hazelwood Ridge it descends to 129the Ave SE and passes behind the Lake Boren Townhomes, with access to the north shore of Lake Boren. From the Townhomes (at SE 75th Street) it continues, mostly on boardwalks, along the north side of China Creek to the Parkway. From here a short walk south (past the Aegis Gardens senior living community) will bring you to the East CrossTown Trail. Trail signs are planned. Note: The east end of the trail is closed by a fence at the Parkway, awaiting trail work required by the City; the opening date is indefinite. The trail is now complete from Coal Creek Parkway all the way into Cougar Mountain Park, mostly in woodland with scenic viewpoints. Newcastle Trails played a major role in obtaining the last easement needed. The City hired the WCC (Washington Conservation Corps) to build the final link on heavily wooded slopes from Beit Tikvah to Newcastle Vista. And major improvements were made all along the trail, with many hours of work by Peggy Price, Boy Scouts, and other volunteers. Further improvements are planned, including trail signs from the Parkway to the Terrace Trail junction. RSD Newcastle is the official name for the proposed 30-home development in the School Woods between the Hazelwood and Olympus Neighborhoods. The developer, Quadrant Homes, arranged last year to buy the Woods from the Renton School District (RSD) subject to plat approval by the City. After many public comments on their 2014 preliminary plat, Quadrant withdrew the application; the revised plat was submitted in early 2015. It was approved by the City Council on October 6 with a significant change: 129th Avenue SE, which was platted to connect Hazelwood and Olympus, will be constructed as planned, but closed by a gate on the Olympus side. Trail connections, ignored in the first plat, are provided in the new plat. And we understand that the proposed runoff ditch alongside the CrossTown Trail, which NT opposed, will be replaced by a shared drainage with the townhome development to the east. The existing China Creek Trail will be extended west across 129th Ave SE through the new townhomes into RSD Newcastle. Sadly, NT's trail-friendly proposal for a green trail corridor from the cemetery to the plat's central open space was not among the options submitted to the Council by City staff. This entry was posted in News and tagged assignment, template, categories, on July 3, 2013 by ChristopherG. When RSD Newcastle is constructed in 2016, the trail will be relocated to sidewalks where it crosses the plat. Elsewhere on the trail, improvements are planned: when the new Middle School is completed, the trail will be relocated close to its original route in the woods by the ballfields; and when the remaining private land on the south shore of Lake Boren is purchased, it will be possible to reroute the trail closer to the lakeshore. NT worked to ensure that both routings were included in the current Comprehensive Plan. Thanks to many hours of work by Peggy Price, Boy Scouts, and other volunteers, the trail is walkable from Newcastle Vista to its trail connection within Cougar Mountain Park. Trail improvement work is continuing. And we hope to begin work in 2016 on the "missing link" between Newcastle Vista and Beit Tikvah to the northwest. From Beit Tikvah, west-bound walkers can continue on sidewalks to the West CrossTown Trail at Lake Boren Park. New trail signs have been installed to mark an alternate, safer route for folks taking the Waterline Trail south from Bellevue. Where the trail reaches Newcastle Way, a sign directs walkers southeast along the sidewalk to a crossing at traffic lights near the Newcastle Library. Signs mark the route on sidewalks south from the library to SE 73rd Place, where southbound walkers rejoin the Waterline Trail , which continues on sidewalks past the Lake Boren Townhomes. The trail signs guide walkers to the section of the China Creek Trail behind the Townhomes, and an access trail to the shore of Lake Boren. The developers of the new Aegis retirement home are building the trail, mostly on boardwalks, along the north side of China Creek, which has been rerouted into a graceful curve north of the facility. When the facility is completed in late 2016, the trail will be opened. NT has urged the City to complete another "missing link", a short section of boardwalk linking the existing trail (behind the Lake Boren Townhomes) to the new section. This will provide a continuous trail from 129th Ave SE to the Coal Creek Parkway, with lake, creek, and wetlands on view.